Winter Snow Tufts - 2/4mm contain an olive green tone base tuft with white-snow covered grass shaft. 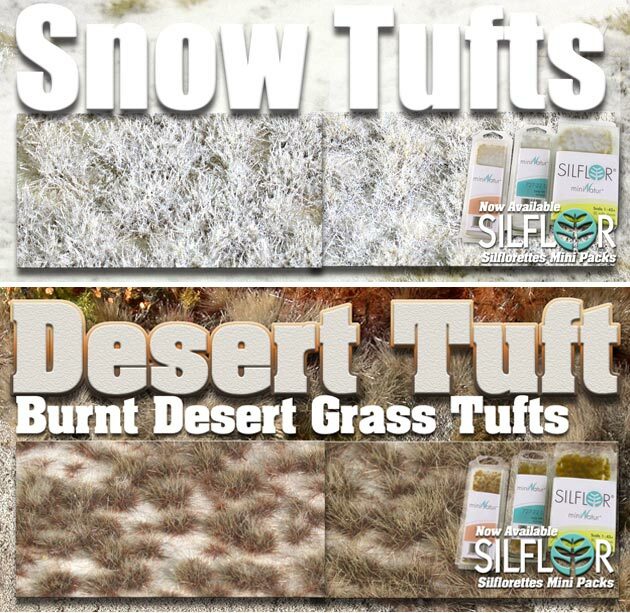 Winter Snow Tufts - 2/4mm "Silflorette"-Size packaging contains an olive green tone base tuft with white-snow covered grass shaft. Each Silflorette contains one sheet measuring 1-1/2" wide by12" long and contains nearly 75 -100 2/4mm length tufts! Frosted Snow Tufts - 4/6mm tufts contain an olive green tone base tuft with white-snow covered grass shaft. Frosted Snow Tufts - contain an olive green tone base tuft with 4/6mm height white-snow covered grass shaft. Each Silflorette contains one sheet measuring 1-1/2" wide by12" long and contains nearly 75 to 100 2/4mm length tufts! Burnt Grass Desert Tufts - 2/4mm - The dry look of burnt grass with reddish-brown grasses of current season highlighted by the sun bleached grass of the previous year. 8" x 12" sheet contains hundreds of tufts! Burnt Grass Desert Tuft "Silflorette" - 2/4mm - The dry look of burnt grass with reddish-brown grasses of current season highlighted by the sun bleached grass of the previous year. Contains one sheet measuring 1-1/2" wide by12" long and contains over 75 tufts! Burnt Grass Desert Tufts - 4/6mm - The dry look of burnt grass with reddish-brown grasses of current season highlighted by the sun bleached grass of the previous year. 8" x 12" sheet contains hundreds of tufts! Burnt Grass Desert Tuft "Silflorette" - 4/6mm - The dry look of burnt grass with reddish-brown grasses of current season highlighted by the sun bleached grass of the previous year. Sheet measuring 1-1/2" by 12" long contains over 75 tufts!